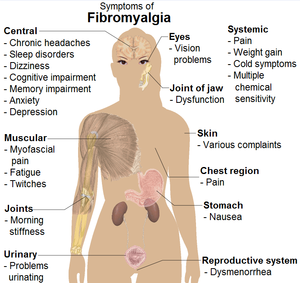 Fibromyalgia symptoms are far from pleasant and usually one of the most painful for many sufferers. Unlike other autoimmune diseases, they are easily confused with those associated with other diseases and might even mimic those seen in lupus patients. As such, if you have any of them, you should get your doctor to refer you to a rheumatologist to diagnose your formally, treat symptoms and prevent any further damage. Most importantly, if you are already getting the pain, you may need help managing that, too. With fibromyalgia, most people have pain in specific tender points. These are found within the soft tissues to the rear of your knees, elbows, shins, hips, lower back, sternum, shoulders and/or neck. This pain can spread beyond these areas, ranging from very mild to very severe burning, shooting, gnawing, radiating and deep-aching sensations. You might wake up to feel stiff and your body filled with aches. Your pain may get better as the day proceeds and then worsen gradually as you get into the evenings. You might simply be in constant pain all day and all night long with no let up. In fact, the pain may appear to be radiating right from within your joints, but your joints are not swollen or red. When you are stressed, anxious or active or the weather is cold and damp, your pain get considerably worse. Other fibromyalgia symptoms may affect some people and not others. You might have problems sleeping and feel fatigued all the time. You might be unable to get to sleep or even stay asleep. You may feel very tired when you have slept all night. Alternatively, you may get migraines, tension headaches, feel depressed or sad and/or have heart palpitations, feet and hand tingling and numbness, thought clarity issues, memory problems, constipation, diarrhea and IBS with gas (irritable bowel syndrome). Though you may not get all of the symptoms and you may go for years unaware that you have fibromyalgia symptoms because they are so mild and/or you have developed coping mechanisms, eventually as you get older you might find them getting more difficult to manage or harder to cope with. Many people who have very active or responsible lives may find that their symptoms start to clash with their need to keep going and to get their work or chores done. Mothers may find that their ability to find energy to cope with kids is getting more difficult. Whatever the case, if you have these symptoms, have them checked out with your doctor. I’ve found some drs dont believe in it. One had me in tears saying it was all in my head and no such thing as fibromaylgia. My Dr now just kinda said ok when I told her I had it. I basically am getting no treatment for it and have so many sore spots right now and can’t sleep well.What do they normally treat it with? Gabriela por casualidad llegue a este blog y creo que con la situación que tienen ustedes deben tratar el Reumofan-Plus.Mi familia me dice que me paso el dia haciéndole un comercial al producto pero es lo único que me ha quitado los dolores de la Fibromyalgia o de la poca artritis que tengo.Padezco de las dos y entre esta medicina y el Reumoplan junto a los ejercicios y el bajar de peso me han ayudado mucho.Suerte! Thank you for this, very helpful, information. I have thought I may have FM for quite a while but my doctors won’t consider it. All the symptoms mimic other conditions I have, or side effects from the medications to treat them, but none EVER relieve the constant ache that I have.